Facebook announced today that video chat is coming to its Messenger Lite app. 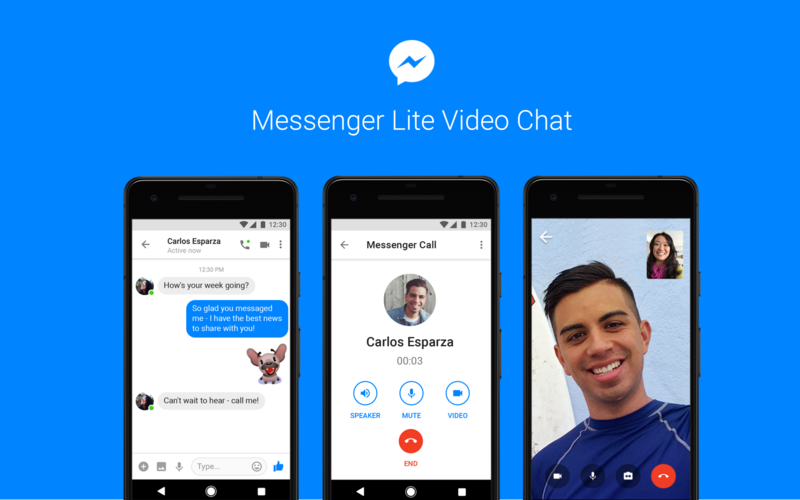 Video chat has been a staple of Facebook's full-fat Messenger app since forever, but the Lite version is traditionally lite on both data usage and functionality. The addition of video calling brings Messenger's more svelte counterpart that much closer to feature parity. Facebook says video chat is an increasingly popular way for its users to interact; there were 17 billion video calls placed in the Messenger app in 2017, it says, more than double the number from the preceding year. Video calls will work the same way in Lite as they do in the classic Messenger: one user taps the little video camera button in the top-right corner of a chat, the other user accepts the call, and a video chat is underway. Messenger Lite is positioned as an alternative to the regular Messenger for people with older devices or slower data connections, but it's also great for people who want to chat without all the bells and whistles of the full Messenger. The app was introduced in 2016 and targeted primarily toward emerging markets; it wasn't made officially available in the US until about a year later. The rollout begins today, according to Facebook. Despite the app's focus on conservative use of mobile data, Facebook didn't mention whether video chats in Messenger Lite will use less data than those in classic Messenger.